For someone who’s got the national profile of Senator Cory Booker, it’s remarkable that the number of attendees at his “Coffee with Cory” event a couple of weeks ago didn’t fill the room it was in over capacity. Fellow Talbot Digital intern Bridget and I went, since we’re (proud) New Jerseyans and we think Mr. Booker is pretty cool. As is the habit of politicians, the Senator was late to his own event, but the uproar was pretty massive when he walked in. Everyone was already chatting with one another – raising both arms in greeting and yelling, “Hello, everybody!” to get the room’s attention. After talking a bit about himself and greeting the students in the room who were there as part of their prize for winning a current events project competition, Senator Booker had a short while to take questions from the audience. While people asked some questions about political issues, the Senator got slightly distracted by the fact that one of the curious members of the audience was from Wayne Valley High School – a school which Booker had played football against in the 1986 state championship. Overall, there was quite a lot of New Jersey-based bonding going on in the room, which is always entertaining to see. Other states may not think we’re much to talk about, but Booker and the rest of us are proud of our state nonetheless. Since the Senator had to run to a vote on the floor and was thus short on time both at the beginning and at the end, he had to cut questions short because he wanted to take pictures with the audience. He explained to us that he was, in fact, a master of the selfie and his goal was to take selfies with every single one of his colleagues and had gotten through quite a few of them already. The room wasn’t packed, but there were enough people that taking selfies with all of them took some time, though many got non-selfie pictures taken as well. 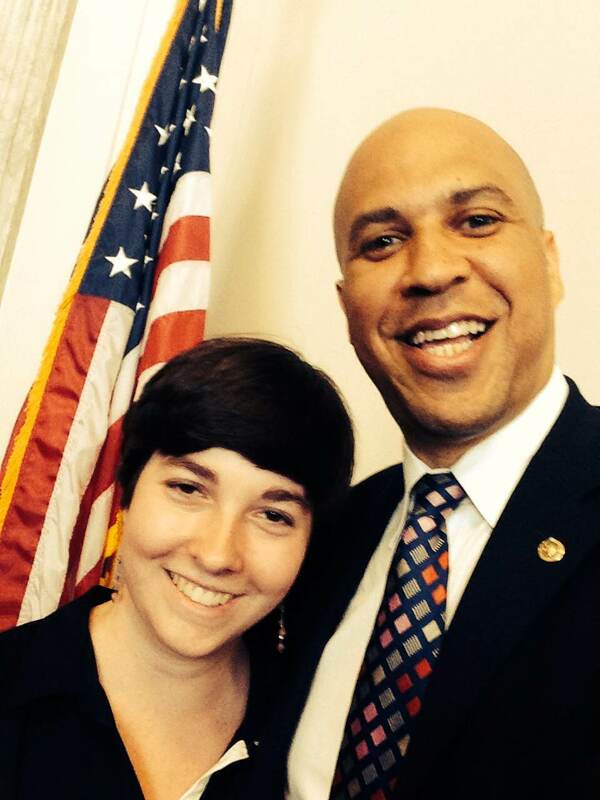 Naturally, I personally opted for the selfie choice, so now I’ve got evidence on my phone both of meeting Cory Booker and of the fact that he’s one chill dude. Even though one might think all that superheroing keeps him from being down to earth, he managed to talk about politics, football, selfies, and good old Jersey in just an hour. Overall, even though it was short, I’d gladly go again – this New Jerseyan is proud to say that the November election can’t come quickly enough. Tagged cory booker, interns, new jersey, senate.